What's the weather got in store? After a cloudy start, with some patches of drizzle, skies should brighten leaving a pleasant afternoon with some sunshine and highs of 23C (73F). 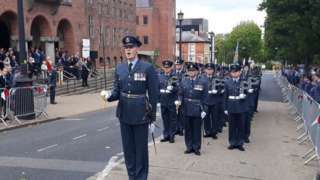 RAF staff march through Dudley as part of a ceremony also marking the Battle of Britain. A5 Shropshire eastbound severe accident, from A49 to M54 J7. A5 Shropshire - A5 blocked and stationary traffic eastbound from Preston Island to Wellington, because of an accident. Shrewsbury record their first League One win of the season as Greg Docherty and Lee Angol score against Southend. Trains between Shrewsbury and Crewe are being delayed this evening due to a fault with the level crossing barriers between the stations. National Rail Enquiries says some services could be delayed by up to 90 minutes and disruption's expected until at least 19:30. There's also a speed restriction over defective track between Oxford and Worcester Shrub Hill which is causing delays of up to an hour and services are being delayed at Telford due to trespassers on the line. Most areas look like staying dry through tonight with some patches of cloud but also some fairly lengthy clear spells with lows of 8C (46F). A world champion mountain biker says the hills of Shropshire helped her to win the title five times. At the weekend, Rachel Atherton again won the women's downhill final at the Mountain Bike World Championships in Switzerland. The 30-year-old, originally from Oswestry, also earned a record sixth World Cup title in August. We grew up around the Shropshire hills and we lived there for that reason, because the terrain was so great for mountain biking, the hills and the people are so supportive." There are fears sick badgers could be driven into Shropshire with the county not included on the latest list of areas for badger culling. The government's announced 11 new areas in England and they say the action aims to battle the spread of bovine TB. It means culling can take place in Herefordshire, Staffordshire and Cheshire - counties that all border Shropshire. Farming minister George Eustice says culls are reducing cases of the disease. We've obviously been classed as being a low-risk area so we haven't got the culling taking place here, but, because it's all around us, my take would be that, inevitably, sick badgers will be driven into Shropshire." 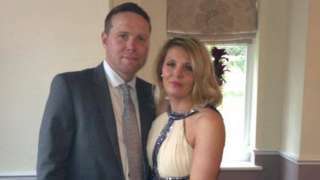 Derek Whyteside, 42, died after being assaulted in Telford on 18 June. A 16-year-old boy is to go on trial later this year charged with the murder of a man in Telford. Derek Whyteside (pictured), 42, of Chesterfield Road in Dawley, died after being assaulted in Withywood Drive in Malinslee on 18 June. The teenager, who cannot be named for legal reasons, pleaded not guilty to murder at Stafford Crown Court today and was remanded into custody. Two men, William Owens, 41, and Gareth Edward Owens, 39, both of Boulton Grange in Randlay, also appeared at the court today. They both pleaded not guilty to affray and were given bail ahead of the trial, due to start on 5 November. Nearly 50 teams will take part in the Coracle World Championships in Shropshire today. The event gets under way from 14:30 on the River Severn in Shrewsbury and raises money for Macmillan Cancer support. Coracles are small, round-shaped, lightweight boats which were designed, hundreds of years ago, to be carried on a person's back, often with a chest strap holding the boat steady. Thought to predate the Roman invasion, they have been dubbed Britain’s strangest boat. It should be a mainly dry day with some patchy rain possible this afternoon and highs of 17C (63F). It should be a dry night with some clear spells and lows of 7C (45F). A quarter of all children aged between four and five in Telford and Wrekin are overweight or obese, according to the local council. Councillors meeting this evening will be told the figure's worse than the national average. The annual report of the borough's director of Public Health also says adults aren't getting enough exercise - and sets a number of priorities to tackle obesity and promote healthy living. The use of synthetic drug Black Mamba could be partly to blame for an increase in violence towards emergency workers in the region said a paramedic. "We've got quite a problem in the West Midlands with Black Mamba", said Natasha Starkey, "so we get quite a lot of assaults from that because unfortunately some of the patients we go to can be quite violent". But, she said, it may also be down to the fact that workers were also talking about the problem more. "Years ago you didn't report it and just got on with it, and didn't really say much about it." A paramedic, working in the West Midlands, said assaults whilst at work have come to be "expected". Maximum prison terms for people found guilty of assaulting emergency workers are to double from six months to a year. Natasha Starkey, who's been assaulted while on duty said "you don't come to work to be attacked" but sometime it's expected". Attacks on staff have been going on for more than "my short four-year-career" she said. "I've been spat at, I've been punched, I've been shoved against the ambulance, had sexual comments passed to me." However, she said the benefits of helping people outweigh the risk of being seriously hurt. Shropshire's biggest charity shop has opened in Shrewsbury today. The 6,000-square-foot superstore in Castlefields is the latest venture by Severn Hospice. The charity has thanked volunteers, local residents and businesses for donating thousands of items to fill the shelves ready for the big opening. Three men are arrested and released under investigation for offences under the Deer Act, police say.